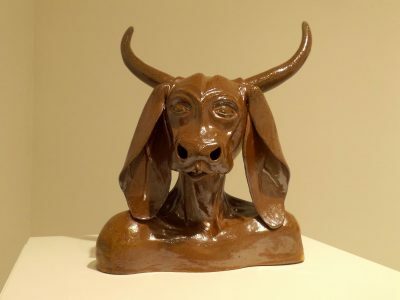 Artist Alaska Gilmour let her friend name her entry in Stetson’s 29th Annual Undergraduate Juried Exhibition “because I honestly didn’t think it would win anything,” Gilmour said of her quasi-anthropomorphic ceramic bust of a Brahman bull. Artist Ysabel Flores didn’t realize until recently that one of her entries, a painting of a man perusing books in what appears to be a refrigerated section of a grocery store, is really a self-portrait. Gilmour’s ceramic, named “Rage,” by her friend Natalie Greenshields, won the Ann West Hall Best of Show Award. 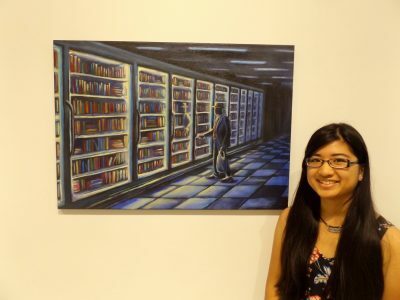 Flores’ painting, “The Search for Self,” won the Charlene Thomas Award of Excellence. Flores also earned a Friends of Art Purchase Award for her ceramic work “Formal Gatherings,” making her the exhibition’s only multiple-award winner. The 29th Annual Undergraduate Juried Exhibition runs through Dec. 7 at the Hand Art Center on Stetson’s DeLand campus. Sixty-two student artists submitted 129 works to be considered for the show. 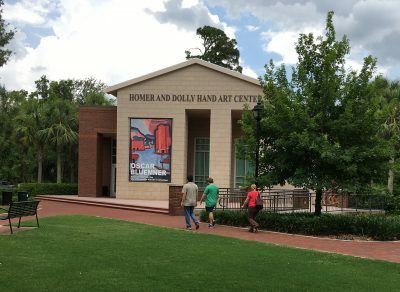 Stetson art faculty chose 77 pieces from 36 artists to be exhibited. 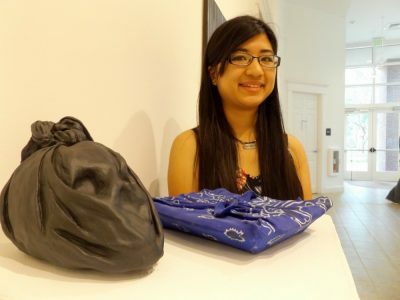 Gisela Carbonell, Ph.D., curator of the Cornell Fine Arts Museum at Rollins College, judged the show and chose the winners of six awards, while Stetson students voted on the Student Choice Award. All Stetson students regardless of major were eligible to participate in the exhibition. This year’s show includes works by 16 non-art majors. 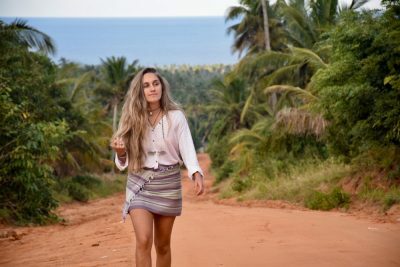 Gilmour, a junior with a double major in psychology and studio, currently is in Thailand as part of an exchange program. A fifth-generation native of Zimbabwe, Gilmour noted her family, who still lives there, breeds Brahman bulls. “I’ve grown up around these floppy-eared cows my whole life, so I guess that was my inspiration for the piece,” she said. Her main mediums are oils and ceramics, but she had never worked in the latter until she took a class under Professor Dan Gunderson in her first year. Gilmour is uncertain which of her degrees she will pursue as a career path. “Sometimes I get overwhelmed by it — learning about stuff I’m not comfortable with, stuff that makes you question your whole identity, that makes you question your religion and why you believe what you believe. But at the same time, I find it interesting. That’s why I did religious studies. I enjoy learning how people find their identity in religion or in a tradition. Flores’ award-winning ceramic work, “Formal Gatherings,” is composed of a skull-like shape wrapped in black cloth paired with a square plate-like object wrapped in blue cloth. Flores hopes to earn a graduate degree in studio art and teach art, but she also hopes to continue pursuing religious studies. The 29th Annual Undergraduate Juried Exhibition runs through Dec. 7 at the Hand Art Center on Stetson’s Palm Court/Quad, 139 E. Michigan Ave., DeLand. Admission is free and open to the public. Designated parking is available in the lots at East Arizona Avenue.